The Supreme Court returned the case on the affirmative action admissions policy at the University of Texas at Austin to a lower court, thereby avoiding a major ruling on the issue. NBC's Pete Williams reports. The Supreme Court on Monday allowed affirmative action to survive in college admissions but imposed a tough legal standard, ruling that schools must prove there are “no workable race-neutral alternatives” to achieve diversity on campus. While the ruling was not a sweeping pronouncement on the future of affirmative action, it amounts to a warning to colleges nationwide that the courts will treat race-conscious admissions policies with a high degree of skepticism. By a 7-1 vote, with one justice recusing herself, the court sent a case about the University of Texas admissions policy back to a federal appeals court for review, and directed the appeals court to apply an exacting legal standard known as strict scrutiny. 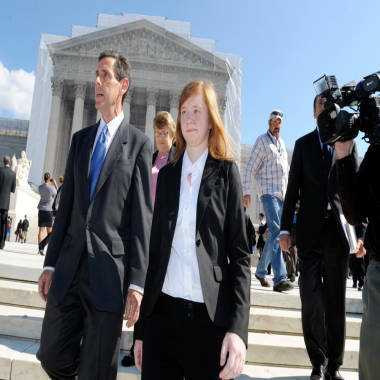 The case was brought by Abigail Fisher, a white woman who applied to the university in 2008 and was denied, and claimed that her constitutional rights and federal civil rights laws were violated. “I am grateful to the justices for moving the nation closer to the day when a student’s race isn't used at all in college admissions,” Fisher said in a statement. The appeals court sided with the university. But the Supreme Court ruled that the lower court did not hold the university to the “demanding burden of strict scrutiny.” Instead, the lower court “presumed that the school had acted in good faith” and required Fisher to show otherwise, the high court found. While the ruling was favorable to Fisher, civil rights advocates were “really breathing a sigh of relief,” said Tom Goldstein, the publisher of SCOTUSblog and a Supreme Court analyst for NBC News. Abigail Fisher, the Texan involved in the University of Texas affirmative action case, and Edward Blum, who runs a group working to end affirmative action, walk outside the Supreme Court in Washington, Wednesday, Oct. 10, 2012. The University of Texas admits about three-quarters of its students by guaranteeing a spot to anyone who finishes near the top of his or her high school class. When Fisher applied, the standard was the top 10 percent of the class. For the remainder of undergraduate admissions, race is considered as one of many factors. A Supreme Court ruling in 2003 allowed public universities to consider race to get a critical mass of minority students, but Justice Sandra Day O’Connor, who wrote that opinion, has since retired, and today’s court is more conservative. Instead, the burden of proof is on a university to show that “each applicant is evaluated as an individual and not in a way that makes an applicant’s race or ethnicity the defining feature of his or her application,” the court said, quoting language from the 2003 opinion. The university’s president, Bill Powers, said that the school would defend its policy once again before the appeals court, and said he was confident that it would meet the high legal bar set by the Supreme Court. “We remain committed to assembling a student body at The University of Texas at Austin that provides the educational benefits of diversity on campus while respecting the rights of all students and acting within the constitutional framework established by the Court,” he said in a statement. Justice Clarence Thomas, joining the majority but writing his own opinion, argued that considering race in college admissions is categorically prohibited by the Constitution’s guarantee of equal protection under the law. Thomas noted that slaveholders once argued that slavery civilized blacks, and that segregationists once argued that separating students by race was good for blacks because it protected them from racist whites. Justice Ruth Bader Ginsburg, part of the liberal wing of the court, was the dissenter. Justice Elena Kagan, who worked on the issue while she was solicitor general under President Barack Obama, recused herself from the case. The decision is not the court’s final word on affirmative action. It has agreed to take a case in its next term about whether voters can ban affirmative action in their states. In the latest NBC News-Wall Street Journal poll, 45 percent said that they believe affirmative action programs are still needed to counteract the effects of discrimination against minorities. That was the lowest reading since 1991, when the question was first asked. An equal 45 percent said they felt that the programs have gone too far and should be ended because they unfairly discriminate against whites. The Supreme Court still has three major rulings to make in this term. One is a challenge to a key provision of the Voting Rights Act of 1965, and two are about gay rights — challenges to the 1996 Defense of Marriage Act, which blocks federal recognition of gay marriages, and Proposition 8, a California ban on gay marriage. The Supreme Court said it would issue decisions Tuesday and on at least one day after that. Supreme Court terms traditionally, though not always, end in June.